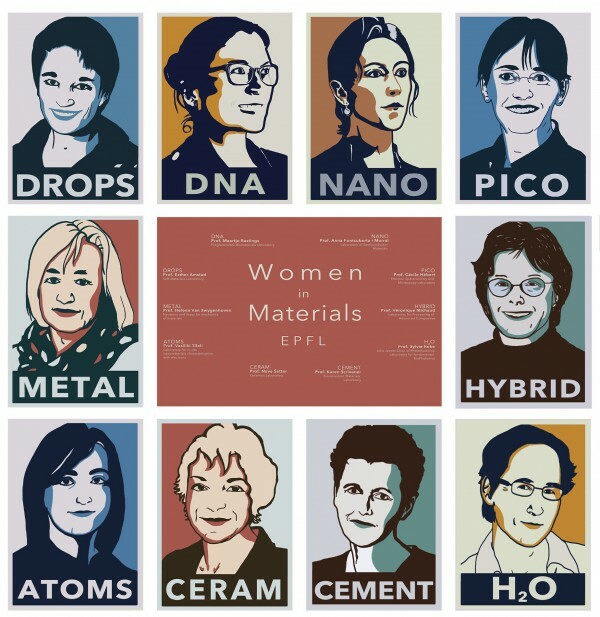 The Institute of Materials (IMX) has inaugured artwork celebrating its women faculty in the entry hall of building MX. The installation, which is two meters high and two meters wide, features nine currently active members of the department and one professor emeritus and was designed by graphic designer Alban Kakulya. The project, sponsored by IMX and NCCR MARVEL, was initiated by MARVEL director Nicola Marzari after he saw a similar display at Imperial College in London and realized how strong was IMX in this respect. Dr. Homeira Sunderland, deputy director of IMX and herself an artist, lead the two-year search for the perfect tribute. Having looked through many proposals, she knew she had found the right match when she saw Kakulya’s. Instead of simple photographs, he suggested graphic portraits inspired by them. The featured faculty now include Professor Esther Amstad, Professor Maartje Bastings, Professor Anna Fontcuberta i Morral, Professor Cécile Hébert, Professor Véronique Michaud, Professor Sylvie Roke, Professor Karen Scrivener, Professor Emeritus Nava Setter, Professor Vasiliki Tileli and Professor Helena van Swygenhoven. The artwork has been designed such that additional portraits can be added as professors join the IMX faculty.